There are many geometry formulas you will use during your time studying geometry. GradeA presents clear graphics and explanations to help you understand all of these formulas.. Please select from the quick links below, or feel free to scroll through the page to look at all of the formulas. For a comprehensive formula sheet that is perfect store in your website, view this website's geometry formulas. Perfect for your notebook! Triangle: A three sided figure. Rectangle: A quadrilateral with four right angles. Parallelogram: A quadrilateral with two pairs of opposite sides parallel. Trapezoid: A quadrilateral with exactly one pair of opposite sides parallel. Circle: A set of points all equidistant from a given point - the center. Any Regular Polygon: A figure with all sides and angles congruent. For more details, read visit our pythagorean theorem page, or visit our biography of pythagoras, the man credited with the discovery of the famous formula. Many geometry students begin to learn the trigonometric functions towards the end of the course. You probably are only going to use the first three functions, sin, cos, and tan, but we listed all 6 just in case. For a lot more details about trigonometry, visit GradeA's trigonometry page. Special right triangle have side lengths that always remain in proportion. So unlike with the pythagorean theorem where you need to know two side lengths to find the third, in this case you only need to know one side lengh in order to find the other two. Visit GradeA's 45-45-90 right triangle page. 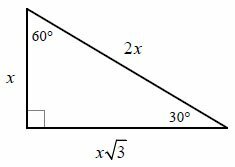 Visit GradeA's 30-60-90 right triangle page. The formulas shown below are to be used on the coordinate plane. The first point is given as (x1, y1) and the second point is (x2, y2). For your problem, it does NOT matter which point you name "first" and which point you name "second." You may also want to view our free geometry help page for additional geometry resources, or you can visit the GradeA homepage for even more free math help resources. As always, they are GradeA!